Looking for a fun, inexpensive party favor that is both a great accent and a fabulously practical gift that your guests will love? 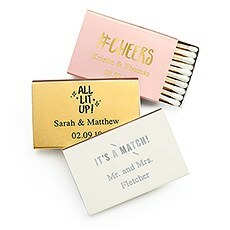 Check out our fully customizable selection of matches! Our matchbooks and match boxes favors will light up the night.These quality matches will help you catch the spirit and the sentiment of your wedding, celebration or just-because soiree! Help your guests remember what a fantastic party you threw with our personalized matches, available in a huge range of colors and designs.Incorporate these customized, engraved matches into your table-top decor, use them at cigar bars or create fabulous DIY favors by pairing them with lovely-scented candles to hand out to each of your guests. Or check out our adorable tea light lanterns in our party favor section of The Knot Shop - these lanterns would make a dynamic duo with our custom matches! Use your imagination and come up with a decor or a fab favor spin that will personalize your party even more!Your customized matchbooks or match boxes can say exactly what you want them to. Choose wedding and engagement categories or other themed logos. Fun, festive wedding and engagements sayings include "Let the sparks fly," "Eat drink and be married," and "I do." Or choose from other themes to celebrate with your guests. Find splendid sayings like "#Cheers," "All lit up," and "Hello New Year! "Customize these matches down to the book's color, phrasing and color of the embossed foil impressions that are made on each surface. Choose romantic, modern, trendy or whimsical themes - The Knot Shop has everything you need!Go ahead - play! The Knot Shop makes it easy-peasy for you to choose, create and try before you buy. Try your design with different colors, texts and saying to make sure you get exactly what you want from your personalized matchbooks or match boxes.Your guests (and you!) 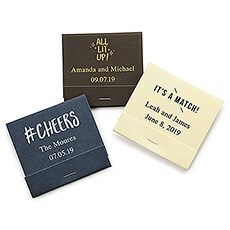 will be thrilled with personalized matches from The Knot Shop. See how easy it is to add a fabulous, personalized touch to every event you host!